Biopact, a site that has provided exceptional coverage of bioenergy and related issues for the past five years, today announced it will no longer be updating its web site. The founders, who are moving on to pursue other noble projects, have graciously directed the site's readers to mongabay. While our sites differ in focus and perspective, we share a similar philosophy and Mongabay will do its best to carry on Biopact's legacy. Biopact will be missed but its content will live on at Biopact.com. (12/11/2008) Finland and Sweden are pushing for a loophole in the E.U. 's Renewable Energy Directive that would open up vast tracts of peatlands around the world to development for biofuels production. The move could have drastic consequences for climate and biodiversity, warns Wetlands International, an environmental group. (12/03/2008) Producing biofuels from oil palm plantations established on degraded grasslands rather than tropical rainforests and peat lands would result in a net removal of carbon from the atmosphere rather than greenhouse gas emissions, report researchers writing in Conservation Biology. The results confirm that benefits to climate from biofuel production depend greatly on the type of land used for feedstocks. (12/02/2008) A dramatic fall in palm oil prices may provide an opportunity for plantation giants to add to their holdings, reports Reuters. (11/11/2008) Scientists should compare the biodiversity oil palm plantations to other industrial monocultures, not the rainforests they replace, said Dr. Yusof Basiron, CEO of the Malaysian Palm Oil Council (MPOC), in a post on his blog. Basiron's comments are noteworthy because until now he has maintained that oil palm plantations are "planted forests" rather than an industrial crop. (11/10/2008) The first shipment of palm oil certified under the Roundtable on Sustainable Palm Oil (RSPO) is expected to arrive in Europe Tuesday, but an environmental group is already criticizing the initiative's credentials. (11/07/2008) Eight developing countries threatened to file a World Trade Organization complaint against the E.U. for its proposed legislation to require imported biofuels to meet environmental standards, reports Reuters. (10/27/2008) Boeing says biofuel-powered planes are only three-to-five years away from being a reality, reports The Guardian. Cellulosic biofuels endanger old-growth forests in the southern U.S.
(10/16/2008) Cellulosic biofuel is on its way. This second generation biofuel — so-called because it does not involve food crops — has excited many researchers and policymakers who hope for a sustainable energy source that lowers carbon emissions. However, some believe that cellulosic biofuel may prove less-than-perfect. Just as agricultural biofuels have gone from being considered 'green' to an environmental disaster, some think the new rush to cellulosic biofuel will follow the same course. Scot Quaranda is one of those concerned about cellulosic biofuel’s impact on the environment. Campaign director at Dogwood Alliance, which he describes as "the only organization in the Southern US holding corporations accountable for the impact of their industrial forestry practices on our forests and our communities", Quaranda condemns cellulosic biofuels as dangerous to forests “by its very definition”. (10/08/2008) The Malaysian palm oil industry is relying on marketing tactics that mislead the public about its environmental performance rather than taking effective steps to become "greener" alleges a new report from the environmental group Friends of the Earth (FOE). (10/02/2008) The U.S. lacks criteria to ensure that cellulosic ethanol production will not harm the environment, warn scientists writing in the journal Science. The researchers say that with proper safeguards, cellulosic ethanol can help the U.S. meet its energy needs sustainably. (09/15/2008) Urgent conservation measures are needed to protect some of the world's most endangered primates from the hunting, logging, and oil palm development in a region that has only recently emerged from a period of civil strife, report researchers writing in the open-access journal Tropical Conservation Science. (09/15/2008) The Tana River forest in coastal Kenya is home to a diverse array of bird species but is increasingly under threat from logging, agricultural expansion, and unsustainable harvesting of some bird species, reports a new study published in the open-access journal Tropical Conservation Science. (09/15/2008) Conversion of primary rainforest to an oil palm plantation results in a loss of more than 80 percent of species, reports a new comprehensive review of the impacts of growing palm oil production. The research is published in the journal Trends in Ecology and Evolution. (09/15/2008) Indonesia's Commission for Child Protection has accused Malaysia's oil palm planters of enslaving migrant workers and their children at plantations in the state of Sabah on the island of Borneo, reports The Jakarta Post. Arist Merdeka Sirait, secretary general of the commission, told the newspaper that a fact-finding team sent to Sabah discovered "tens of thousands of Indonesian migrant workers and their children had been 'systematically enslaved,'" by Malaysian plantation owners. (09/12/2008) The E.U. voted to relax biofuels targets following widespread criticism of their social, economic, and environmental impacts. Thursday the European Parliament's Industry and Energy Committee said it would push a plan calling for a 5 percent share of renewables in transport fuel by 2015 and a 10 percent target by 2020, a reduction from the 20 percent target set forth in March 2007. The plan effectively cuts targets for biofuels produced from conventional feedstocks to four percent in 2015 and six percent in 2020. (09/10/2008) Plunging palm oil prices are increasing its attractiveness as a biofuel feedstock and thereby helping buoy demand for the oilseed, reports Reuters. (09/02/2008) Meeting at the Republican National Convention in St. Paul, Minnesota, Republicans Monday called for an end to a requirement that gasoline contain a set amount of ethanol, reports Reuters. (08/28/2008) Palm oil companies operating in Indonesia have rejected a proposed moratorium on clearing forests and peatlands for oil palm plantations, reports the Jakarta Post. (08/28/2008) Conservationists have discovered "surprisingly large populations" of two globally threatened primates in a protected area in Cambodia. Surveys by scientists with the Bronx Zoo-based Wildlife Conservation Society (WCS) and the Cambodian government counted 42,000 black-shanked douc langurs and 2,500 yellow-cheeked crested gibbons in Cambodia's Seima Biodiversity Conservation Area. (08/27/2008) The British government should end subsidies for biofuels and instead use the funds to slow destruction of rainforests and tropical peatlands argues a new report issued by a U.K.-based think tank. The study, titled "The Root of the Matter" and published by Policy Exchange, says that "avoided deforestation" would be a more cost-effective way to address climate change, since land use change generates more emissions than the entire global transport sector and offers ancillary benefits including important ecosystem services. (08/25/2008) Facing land scarcity at home and environmental complaints, Malaysian palm oil producers should look overseas to expand operations, a high-ranking Malaysian agricultural minister said Monday. (08/15/2008) Algae could be used as a biofuel while simultaneously cleaning up the environment, report researchers at the University of Virginia. (08/06/2008) Brazil would restrict sugar cane cultivation in the world's largest tropical wetland under a proposed plan to protect the Pantanal, reports Reuters. (07/31/2008) Between June 2000 and June 2008, more than 150,000 square kilometers of rainforest were cleared in the Brazilian Amazon. While deforestation rates have slowed since 2004, forest loss is expected to continue for the foreseeable future. This is a look at past, current and potential future drivers of deforestation in the Brazilian Amazon. (07/25/2008) Under attack by politicians, aid groups, and environmentalists for driving up food prices and fueling destruction of ecologically sensitive habitats, some of the world's largest agroindustrial firms have formed a lobby group to influence consumers and lawmakers to support continued subsidies for biofuel production, reports Reuters. (07/22/2008) Biofuels meant to help alleviate greenhouse gas emissions may be in fact contributing to climate change when grown on converted tropical forest lands, warns a comprehensive study published earlier this month in the journal Environmental Research Letters. Analyzing the carbon debt for biofuel crops grown in ecosystems around the world, Holly Gibbs and colleagues report that "while expansion of biofuels into productive tropical ecosystems will always lead to net carbon emissions for decades to centuries... [expansion] into degraded or already cultivated land will provide almost immediate carbon savings." The results suggest that under the right conditions, biofuels could be part of the effort to reduce humanity's carbon footprint. (07/17/2008) Government support of biofuel production in rich countries is squandering vast amounts of amounts of money while exacerbating the global food crisis and failing to meaningfully curb greenhouse gas emissions and improve energy security, alleges a new report from the OECD, the club of industrialized nations. (07/15/2008) Cellulosic ethanol proponents have pushed the idea of using farm waste as a way to boost biofuel production without impacting food crops, but such conversion may carry a hidden cost in areas with insufficient rainfall or lacking irrigation, warns a soil scientist from Washington State University. (07/14/2008) Rising demand for fuel, food, and wood products will take a heavy toll on tropical forests, warns a new report released by the Rights and Resources Initiative (RRI). (07/09/2008) Malaysia's Land Development Authority FELDA has announced plans to immediately establish 100,000 hectares (250,000) of oil palm plantations in the Brazilian Amazon. The agency will partner with Braspalma, a local company, to form Felda Global Ventures Brazil Sdn Bhd. FELDA will have a 70 percent stake in the venture. The announcement had been expected. Last month Najib said Malaysia would seek to expand its booming palm oil industry overseas. The country is facing land constraints at home. (07/07/2008) Britain and the E.U. should exercise caution in pushing for wider use of biofuels, warns a new study commissioned by the U.K. government. (07/01/2008) New investment in renewables and energy efficiency surpassed $148 billion in 2007, rising 60 percent rise from 2006, according to an analysis issued Tuesday July 1 by the UN Environment Programme (UNEP). High oil prices drove the trend. (07/01/2008) Louisiana has signed into law legislation to develop an advanced biofuel industry that excludes corn as a feedstock, reports Biopact. (07/01/2008) Brazil fined two dozen ethanol producers accused of illegal clearing the country's endangered Mata Atlântica or Atlantic rainforest, reports The Associated Press. (06/27/2008) A group of Brazilian ethanol producers has signed the first deal to export certified sustainable ethanol, reports Reuters. (06/25/2008) AThe Kenyan government will allow more than 20,000 ha (50,000) of ecologically-sensitive wetland to be converted into a sugar cane plantation for biofuel production, reports The Guardian. Environmentalists were "shocked" by the decision. (06/23/2008) Using abandoned agricultural lands for biofuel production could help meet up to 8 percent of global energy needs without compromising food supplies or diminishing biologically-rich habitats, reports a new study published in the journal Environmental Science and Technology. (06/23/2008) The U.S. Department of Agriculture may allow farmers to plant corn on million of acres of conservation land to bolster the food supply in response to flooding in the Midwest and record high prices spurred by demand for domestic ethanol production, according to a report in the New York Times. (06/15/2008) Tropical forests face a number of emerging threats said a leading biologist speaking at a scientific conference in Paramaribo, Suriname. Nestle Chairman: Biofuels are "ethically indefensible"
(06/14/2008) The emergence and expansion of biofuels produced from food crops has exacerabted world's agriculture and water crisis and is a bigger short-term threat than global warming, argued Peter Brabeck-Letmathe in an editorial published Thursday in the Wall Street Journal Asia. (06/02/2008) A new institute in the San Francisco Bay Area is seeking to make cellulosic biofuel an economically viable alternative to corn ethanol and gasoline within the next five years. The Joint BioEnergy Institute (JBEI), a partnership between three national laboratories and three Bay Area universities, was formed in June 2007 after the U.S. Department of Energy awarded the institute a $125 million grant to develop better methods for making liquid biofuels from the natural cellulose in trees and grasses. JBEI researchers expect cellulosic biofuels to yield more energy, produce less greenhouse gases, and have less impact on the environment than other alternatives to gasoline, such as corn ethanol. (05/28/2008) Biofuel feedstock expansion in Africa will likely come at the expense of ecologically-sensitive lands, reports a new analysis presented by Wetlands International at the Convention of Biological Diversity in Bonn. (05/27/2008) Next generation biofuels could decimate tropical forests says a leading ecologist from the University of Minnesota. Will consumers pay 10% premium for sustainable palm oil? (05/21/2008) The first shipments of certified eco-friendly palm oil will arrive in Germany during the second half of 2008 according to the head of OVID, a German edible oil industry group. 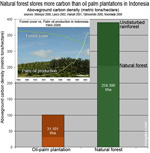 (05/20/2008) More than half of the oil palm expansion between 1990 and 2005 Malaysia and Indonesia occurred at expense of forests, reports a new analysis published in the journal conservation Letters. Analyzing data from the United Nations Food and Agriculture Organization, Lian Pin Koh and David S. Wilcove of Princeton University found that 55-59 percent of oil palm expansion in Malaysia and at least 56 percent of that in Indonesia occurred at the expense of forests. Given that oil palm plantations are biologically impoverished relative to primary and secondary forests, the researchers recommend restricting future expansion to pre-existing cropland and degraded habitats. (05/16/2008) A global moratorium on biofuels produced from food crops would result in a significant decline in the price of corn, sugar, cassava and wheat by 2010, reports the International Food Policy Research Institute (IFPRI). (05/13/2008) Palm oil companies operating in Indonesia pledged to stop clearing forests for new plantations reports The Jakarta Post. The move is a response to growing criticism that oil palm expansion is destroying biologically-rich rainforests and contributing to global warming. (05/13/2008) Preliminary data from Brazil's energy ministry shows that bioenergy derived from sugar cane surpassed hydroelectric power as Brazil's secondary largest source of energy in 2007, reports Biopact. (05/01/2008) Last month's sustainability conference sponsored by the Malaysian Palm Oil Council (MPOC) revealed a rift between some planters and the industry marketing organization. (05/01/2008) High palm oil prices have forced investors to shelve plans for biodiesel refineries, according to The Wall Street Journal. (05/01/2008) Unilever, the world's largest consumer good company, will start using palm oil from certified sustainable sources this year and aims to have all its palm oil certified by 2015, according to a speech delivered today by CEO Patrick Cescau. (04/21/2008) Unilever has admitted to Greenpeace that it can't trace the origin of palm oil supplied by firms operating in Indonesia. The relevation suggests that efforts to improve the sustainability of Indonesian palm oil have stalled as large tracts of rainforest continue to fall for the establishment of new oil palm plantations on the islands of Borneo, New Guinea, and Sumatra. (04/17/2008) Seeking to differentiate its palm oil from that produced less responsibly in other countries, the Malaysian Palm Oil Council (MPOC) sponsored a three-day meeting this week in Kota Kinabalu, on the island of Borneo. (04/03/2008) An industry-led ban on soy production in the Amazon appears to be proving effective at reducing new clearing for explicit soy production, according to a survey published Monday by Greenpeace and the Brazilian Vegetable Oils Industry Association. The moratorium, which was signed by some of the largest soy crushers in the Amazon in response to a campaign by environmental group Greenpeace, went into effect in October 2006. While soy is believed to be having an indirect impact on deforestation by driving up land prices and competing with the dominant form of land use in the Amazon — cattle ranching — the news is a hopeful sign for conservationists. Global warming solutions are harming indigenous people, says U.N.
(04/02/2008) Large-scale solutions intended to help mitigate global warming are harming the very indigenous people who are likely to bear the brunt of climate change, warned the United Nations University (UNU) at a conference in Darwin, Australia. (03/11/2008) Next generation biofuels may trigger the ecological collapse of the Amazon frontier and could have profoundly unexpected economic consequences for the region, warns a paper published in Philosophical Transactions of the Royal Society B. Dr. Donald Sawyer writes that "interacting with climate change and land use, the upcoming stage of cellulosic energy could result in a collapse of the new frontier into vast degraded pasture." The shift could increase the incidence and severity of fires, reduce rainfall in key agricultural zones, exacerbate forest die-back and climate change, and worsen social instability. Sawyer says that while difficult to anticipate, the worst outcomes could likely be avoided be promoting "intensified and more sustainable use" of already cleared areas, minimizing new deforestation, and encouraging "sustainable use of natural resources by local communities." (03/10/2008) Proposed legislation that will expand corn-ethanol production in the United States will worsen the growing "dead zone" in the Gulf of Mexico and hurt marine fisheries, report researchers writing in the Proceedings of the National Academy of Sciences (PNAS). (03/06/2008) The U.N. expects record high food prices to continue through 2010, driving hunger and poverty in the world's poorest countries, said a top U.N. official Thursday. (02/27/2008) More than half the Amazon rainforest will be damaged or destroyed within 20 years if deforestation, forest fires, and climate trends continue apace, warns a study published in Philosophical Transactions of the Royal Society B. Reviewing recent trends in economic, ecological and climatic processes in Amazonia, Daniel Nepstad and colleagues forecast that 55 percent of Amazon forests will be "cleared, logged, damaged by drought, or burned" in the next 20 years. The damage will release 15-26 billion tons of carbon into the atmosphere, adding to a feedback cycle that will worsen both warming and forest degradation in the region. While the projections are bleak, the authors are hopeful that emerging trends could reduce the likelihood of a near-term die-back. These include the growing concern in commodity markets on the environmental performance of ranchers and farmers; greater investment in fire control mechanisms among owners of fire-sensitive investments; emergence of a carbon market for forest-based offsets; and the establishment of protected areas in regions where development is fast-expanding. (02/21/2008) The private sector is "pumping hundreds of billions of dollars" into cleaner and renewable energies, says a new publication released yesterday by the United Nations Environment Programme (UNEP). (02/20/2008) World fertilizer prices surged by more than 200 percent in 2007, as farmers sought to maximize corn production for ethanol, according to the International Center for Soil Fertility and Agricultural Development (IFDC). Poor African farmers were hardest hit by the increase. (02/14/2008) Echoing sentiments increasingly expressed by politicians, scientists, and advocates for the poor, the U.N. Food and Agriculture Organization warned that the world's poorest people are suffering as a result of the push to use food crops for biofuel production. (02/13/2008) Malaysia announced a $103 billion development plan for Sarawak, a state in northern Borneo. (02/12/2008) New York City mayor Michael Bloomberg told reporters Monday that global warming is as big a threat to humanity as terrorism, according to Reuters. (02/12/2008) In mid-January, Mongabay learned that the government of Papua New Guinea had changed its mind: it would no longer allow Vitroplant Ltd. to deforest 70% of Woodlark Island for palm oil plantations. This change came about after one hundred Woodlark Islanders (out of a population of 6,000) traveled to Alotau, the capital of Milne Bay Province, to deliver a protest letter to the local government; after several articles in Mongabay and Pacific Magazine highlighted the plight of the island; after Eco-Internet held a campaign in which approximately three thousand individuals worldwide sent nearly 50,000 letters to local officials; and after an article appeared in the London Telegraph stating that due to deforestation on New Britain Island and planned deforestation on Woodlark Island, Papua New Guinea had gone from being an eco-hero to an 'eco-zero'. (02/07/2008) Converting native ecosystems for production of biofuel feed stocks is worsening the greenhouse gas emissions they are intended to mitigate, reports a pair of studies published in the journal Science. The studies follow a series of reports that have linked ethanol and biodiesel production to increased carbon dioxide emissions, destruction of biodiverse forest and savanna habitats, and water and air pollution. How much would it cost to end Amazon deforestation? (01/27/2008) With Brazil last week announcing a significant jump in Amazon deforestation during the second half of 2007, the question emerges, how much would it cost to end the destruction of Earth's largest rainforest? (01/25/2008) Brazilian government figures will likely show that more than 7,000 square kilometers of Amazon rainforest were destroyed between August and the end December 2007, said environmental group Greenpeace. (01/24/2008) Deforestation in the Brazilian Amazon rose sharply in the second half of 2007 as a result of surging prices for beef and grain, said a top Brazilian environmental official. (01/24/2008) Biofuels used in the European Union will have meet strict environmental requirements said the head of the E.U. 's energy program on Wednesday. (01/18/2008) Global food and consumer goods giants are backing a plan to certify that palm oil is produced in a way that doesn't drive destruction of tropical rainforests, reports The Wall Street Journal. The move comes as the palm industry is facing increasing scrutiny -- and consumer backlash -- for its practices which scientists say are driving large-scale destruction of forests across Indonesia and Malaysia, resulting in massive greenhouse gas emissions. (01/17/2008) U.S. incentives for biofuel production are promoting deforestation in southeast Asia and the Amazon by driving up crop prices and displacing energy feedstock production, say researchers. (01/16/2008) Feedstocks for cellulosic ethanol production could help fight the massive "dead zone" that forms each year in the Gulf of Mexico as a result of current farming practices, says a University of Alabama in Huntsville biologist. (01/16/2008) Mongabay has confirmed that the Milne Bay government has pulled plans to allow Vitroplant to log 70% of Woodlark Island for palm oil plantations. The Minister for Agriculture and Livestock, Hon John Hickey, stated in a press release that "Vitroplant did do a feasibility study and were keen to invest on the island. However due to landowner objections on the development of the oil palm industry on the island, the company has decided to pull out." Vitroplant has yet to comment. (01/15/2008) The E.U. may ban imports of certain biofuel feedstocks that damage the environment, reports The New York Times. Environmentalists say some biofuels like palm oil are driving the destruction of biologically-rich rainforests and may produce more emissions than conventional fossil fuels. (01/15/2008) Biofuels will make up 10 percent of Indonesia's fuel transport consumption by 2010 under a plan announced Monday by a senior government official, according to Reuters. The initiative could ease the economic impact of fuel subsidies - currently some of the highest in the world - in Indonesia, while boosting demand for locally produced bioenergy crops including palm oil, jatropha, sugar cane and cassava. (01/14/2008) Vitro Plant, a developer that planned to log 70 percent of Papua New Guinea's Woodlark Island for oil palm plantations, has pulled out of the project reports The National, a Papuan newspaper. (01/09/2008) A UN economist is touting the potential of DR Congo for industrial biofuels production, reports Reuters. In a telephone interview, Dr Schmidhuber said the worn-torn country could devote millions of acres for oil palm, soy, and other biofuel feedstocks. (01/07/2008) Switchgrass yields more than 540 percent more energy than the energy needed to produce and convert it to ethanol, making the grassy weed a far superior source for biofuels than corn ethanol, reports a study published in Proceedings of the National Academy of Sciences (PNAS). (01/03/2008) Biofuels made from world's dominant energy crops -- including corn, soy, and oil palm -- may have worse environment impacts than conventional fossil fuels, reports a study published in the journal Science. (01/02/2008) In a letter published today in Nature, Oscar Venter, Erik Meijaard and Kerrie Wilson argue that proposals for conservation groups to purchase and run oil palm plantations for the purpose of generating funds for forest protection are unlikely to be successful. The concept was originally put forth by Lian Pin Koh and David S. Wilcove in a 2007 Nature article. (12/27/2007) As world food prices continue to surge, 37 countries are facing critical food crises due to conflict and disasters, according to a report from the U.N. Food and Agriculture Organization (FAO). FAO's global food price index rose 40 percent this year to the highest level on record. (12/18/2007) Tropical deforestation is increasingly enterprise-driven rather than the result of subsistence agriculture, a trend that has critical implications for the future of the world's forests, says Dr. Thomas Rudel, a researcher from Rutgers University. As urbanization and government-sponsored development programs dwindle in the tropics, industrial logging and conversion for large-scale agriculture -- including oil palm plantations, soy farms, and cattle ranches -- are ever more important causes of forest destruction. (12/17/2007) Researchers have confirmed that converting peat forests for oil palm plantations results in a large net release of carbon dioxide, indicating industry claims that palm oil helps fight climate change are unfounded, at least when plantations are established in peatlands. (12/13/2007) Mongabay.com received information this week that the Malaysian company Vitroplant has been granted the permit it needs to begin developing 70% of Woodlark Island into palm oil plantations. In an e-mail received by one of the opposition leaders to Vitroplant, Dr. Simon Piyuwes said that "the government granted the permit to the oil palm company despite a widespread campaign and pressure from NGOs". In an earlier article Dr. Piyuwes stated that "we [the islanders] do not have money to fight the giant. We only hope for the support from the NGOs, and the mercy of the government to withdraw the project." It seems the government has refused Dr. Piyuwes what he hoped for. (12/13/2007) U.S. corn subsidies for ethanol production are contributing to deforestation of the Amazon rainforest, reports a tropical forest scientist writing in this week's issue of the journal Science. (12/07/2007) Initiatives to reduce emissions by reducing tropical deforestation (REDD) will fail unless policymakers adequately address the underlying drivers of forest degradation and destruction, argues a new report published by the Center for International Forestry Research (CIFOR). (12/06/2007) Merrill Lynch is working with Carbon conservation, an ecosystem services firms, to explore opportunities in avoided deforestation and integrated sustainable land management. The partnership was announced Thursday in Bali, Indonesia, where more than 10,000 policymakers, scientists, and activists are meeting to discuss a post-Kyoto framework on limiting climate change. (12/05/2007) The Kyoto climate pact, as it currently stands, ignores millions of tons of carbon dioxide emissions from the drainage of peatsoils for palm oil production in Indonesia and Malaysia, warnned Wetlands International, an international NGO, in a report released at the UN climate meeting in Bali. (12/05/2007) With forest conversion for large-scale agriculture rapidly emerging as a leading driver of tropical deforestation, a new report from the Woods Hole Research Center (WHRC) suggests the trend is likely to continue with Brazil, the Democratic Republic of the Congo, Indonesia, Peru, and Colombia containing 75 percent of the world's forested land that is highly suitable for industrial agriculture expansion. Nevertheless the study identifies forests that may be best suited (low population density, unsuitable climate and soils) for "Reduced Emissions from Deforestation and Degradation" (REDD) initiatives which compensate countries for preserving forest lands in exchange for carbon credits. (12/04/2007) A proposal to pay the Democratic of Congo (DRC) for reducing deforestation could add 15-50 percent to the amount of international aid given to the warn-torn country, reports a new study published by scientists at the Woods Hole Research Center (WHRC). The funds would help alleviate rural poverty while cutting emissions of greenhouse gases and protecting threatened biodiversity. (11/28/2007) A lifecycle analysis of biodiesel by Australia's Commonwealth Scientific and Industrial Research Organization (CSIRO) shows that using palm oil derived from existing plantations can be an effective biofuel feedstock for reducing greenhouse gas emissions relative to conventional diesel fuel. However, palm oil sourced from rainforest and peatlands generating emissions 8 to 21 times greater than those from diesel. (11/26/2007) Europe's demand for supposedly eco-friendly biodiesel is fueling destruction of biodiverse rainforests in southeast Asia, warns a new report from the United Nations Development Programme (UNDP). Is the oil-palm industry using global warming to mislead the public? (11/23/2007) Members of the Indonesian Palm Oil Commission are distributing materials that misrepresent the carbon balance of oil-palm plantations, according to accounts from people who have seen presentations by commission members. These officials are apparently arguing that oil-palm plantations store and sequester many times the amount of CO2 as natural forests, and therefore that converting forests for plantations is the best way to fight climate change. In making such claims, these Indonesian representatives evidently are ignoring data that show the opposite, putting the credibility of the oil-palm industry at risk, and undermining efforts to slow deforestation and rein in greenhouse gas emissions. (11/23/2007) Termites may be the key to greener, more effective biofuels, report scientists writing in the November 22 edition of the journal Nature. (11/12/2007) A new report from Greenpeace alleges that members of the Roundtable on Sustainable Palm Oil -- an industry-driven initiative to clean up palm oil production -- are using palm oil derived by clearing endangered rainforests and draining carbon-rich peatlands on the Indonesian island of Sumatra. (11/12/2007) On Woodlark Island, one-hundred and seventy miles from Papua New Guinea, a struggle is occurring between islanders and biofuel company Vitroplant Ltd. The company is planning to clear much of the island's forest for oil palm plantations to produce biofuels. Vitorplant Ltd.'s contract specifies that they would deforest 60,000 hectares of land for plantations; Woodlark Island is 85,000 hectares in total, meaning over 70% of the island would be converted. Last week, one hundred islanders (out of a total population of 6,000) traveled to the capital of Milne Bay Province, Alotau, to voice their concern over the plans to turn their forested island into plantations. (11/08/2007) Officials from the Indonesian ministry of agriculture and the palm oil industry are distributing materials that misrepresent the carbon balance oil palm plantations, according to accounts from people who have seen presentations by members of the Indonesian Palm Oil Commission. Ministry of agricultural officials are apparently arguing that oil palm plantations store and sequester many times the amount of CO2 as natural forests and therefore converting forests for plantations is the best way to fight climate change. In making such claims, these Indonesian officials are ignoring data that show the opposite, putting the credibility of the oil palm industry at risk, and undermining efforts to slow deforestation and reign in greenhouse gas emissions. (11/06/2007) A proposed mechanism for generating carbon-negative bioenergy -- an energy source that reduces atmospheric carbon dioxide levels -- could drive large-scale deforestation in the tropics and undermine efforts to conserve forests for carbon offsets says a biofuel expert. (10/31/2007) The Dutch government will exclude palm oil from "green energy" subsidies as growing evidence suggests that palm oil is often less sustainable than advertised.